Explainxkcd note: The image below is accelerated to show a full day's spin in approximately 10 seconds. 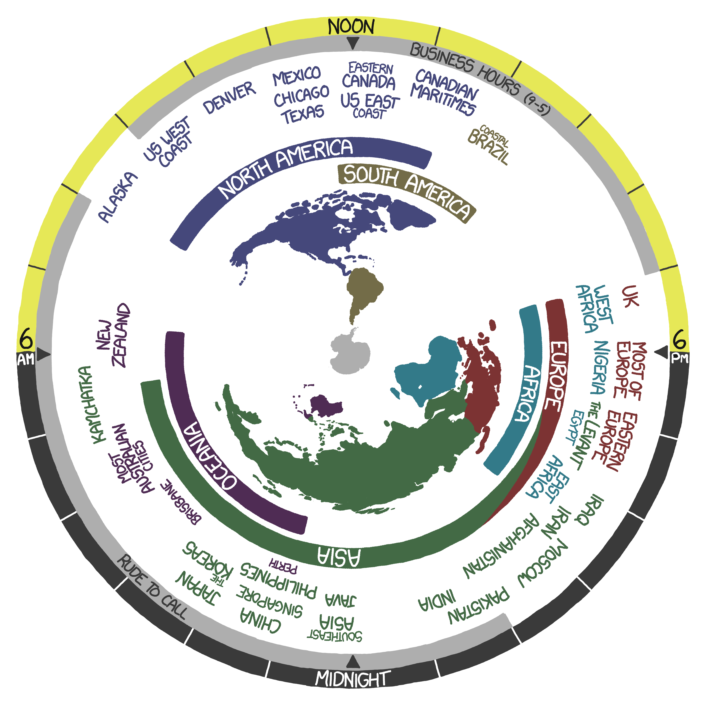 The actual comic completes one revolution per day. The picture is divided in 24 segments representing the 24 hours of the day. At noon and at midnight the break between segments is indicated by the tip of a dark grey triangle. The picture rotates by 3.75 degrees every 15 minutes, as does the Earth, so that it is constantly up to date in showing which regions are currently at which times of day. 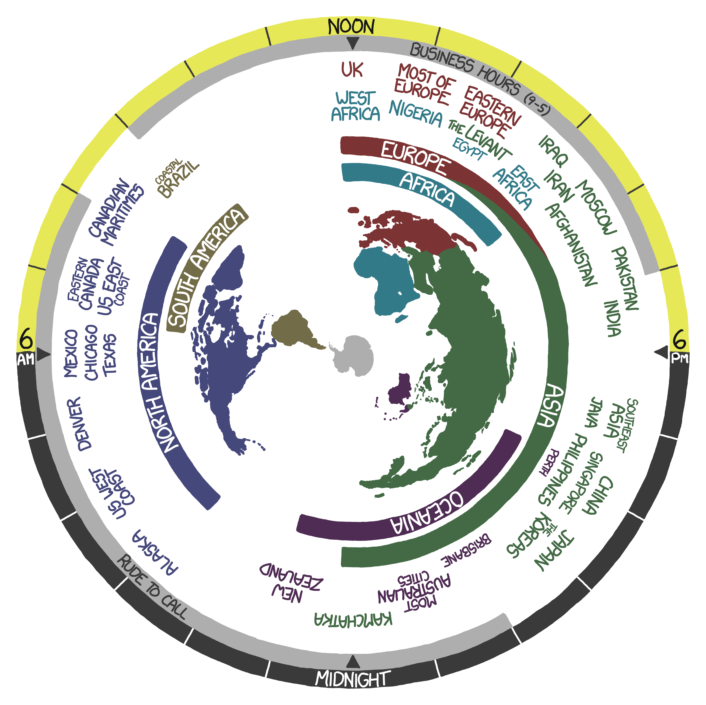 The picture change seems to happen half-way through a 15-minute time increment (that is, at 7½, 22½, 37½, and 52½ minutes after each hour), so that the picture is always correct for the nearest multiple of 15 minutes. The map projection of the earth in the middle of the picture shows an azimuthal equidistant projection with the South Pole in the center. This is unusual, as the projection typically puts the north pole in the center, but necessary in order for it to rotate clockwise. Randall was playing on projections before in 977: Map Projections. 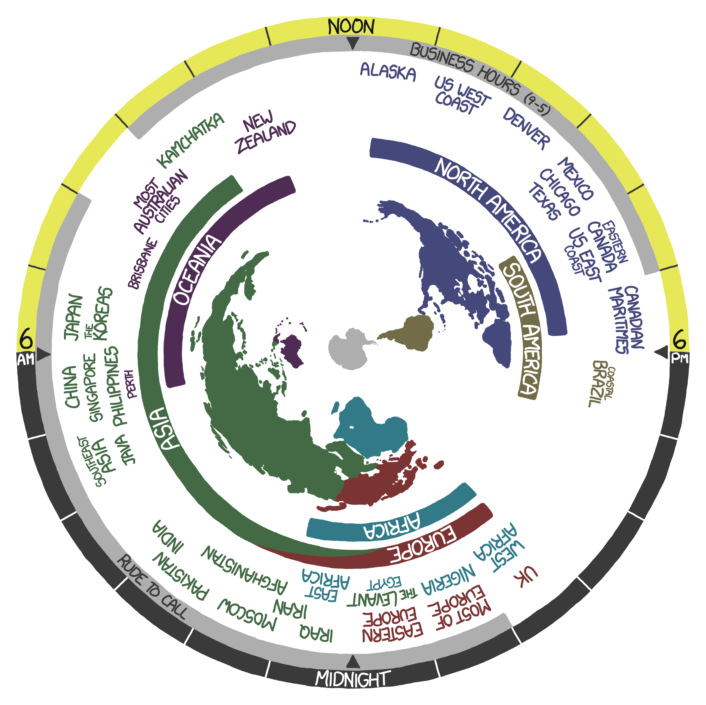 The list of cities and countries doesn't match the map exactly - notice how the continent of Australia is shifted counterclockwise of the words "most Australian cities". 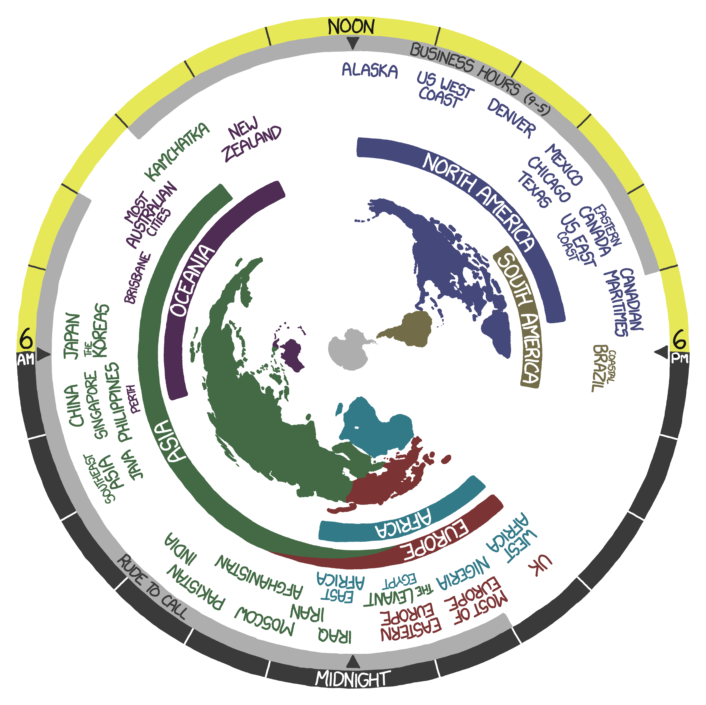 This is because the map is centered relative to the time zones and the local variations therein. 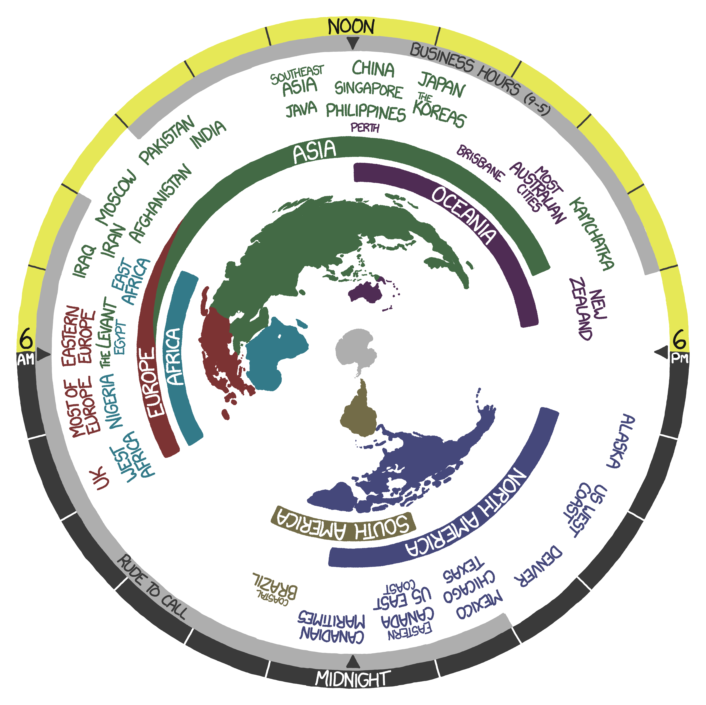 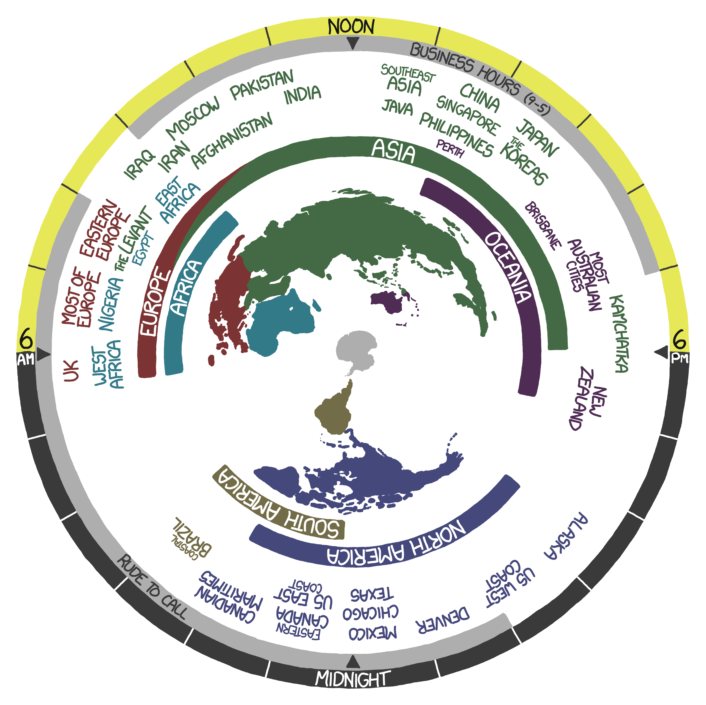 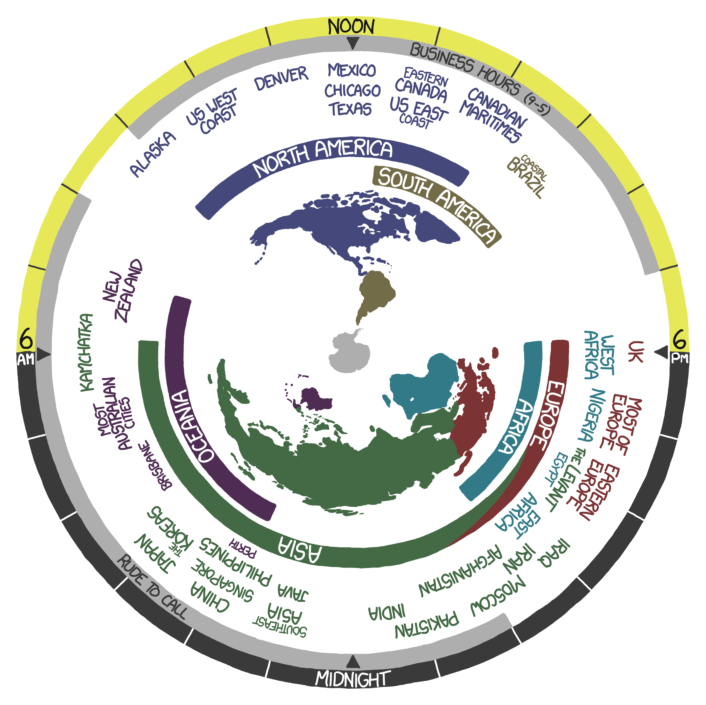 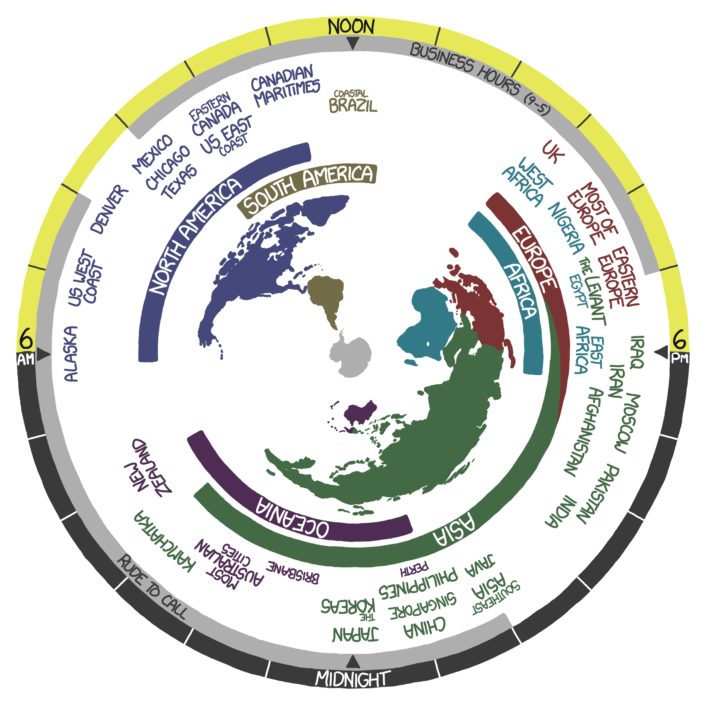 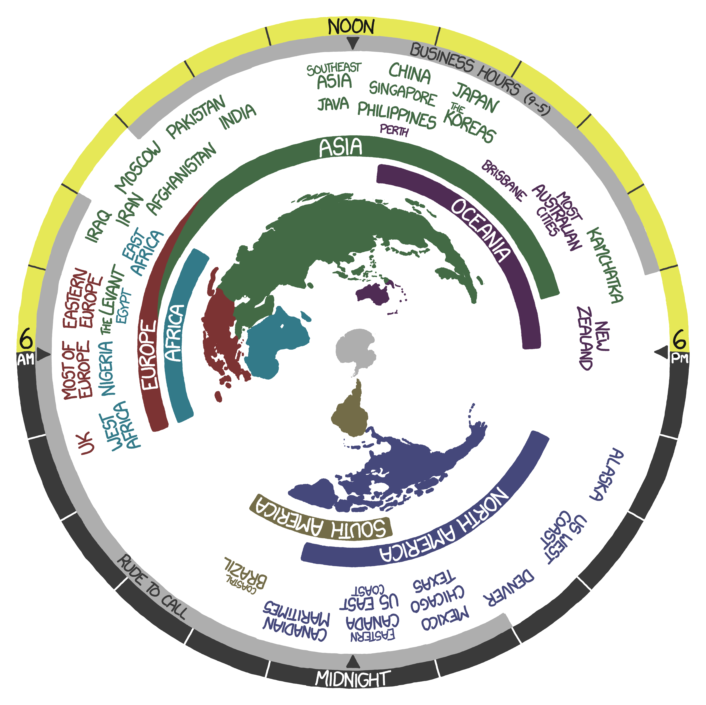 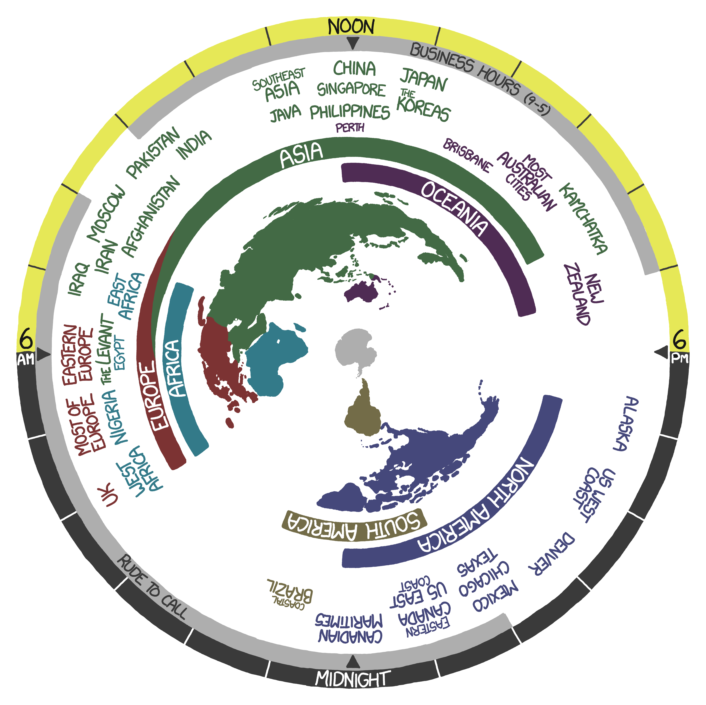 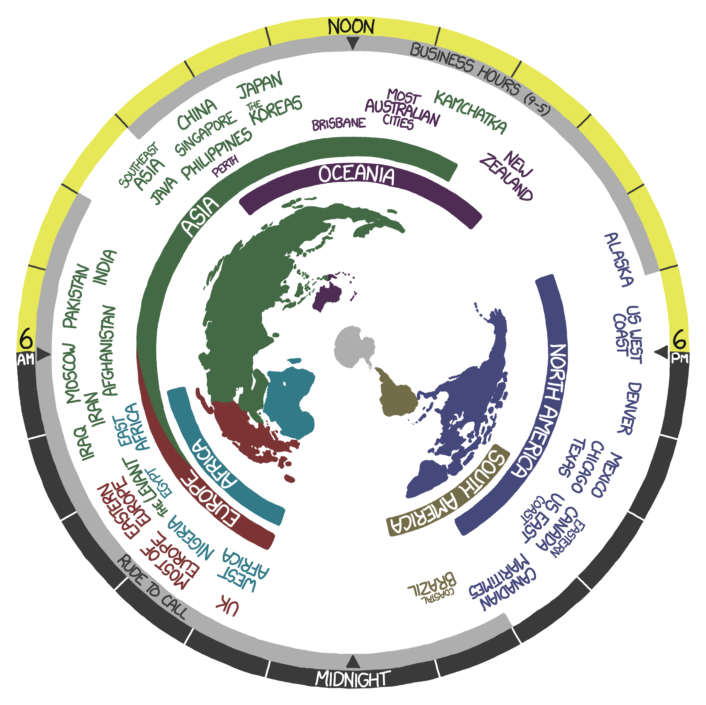 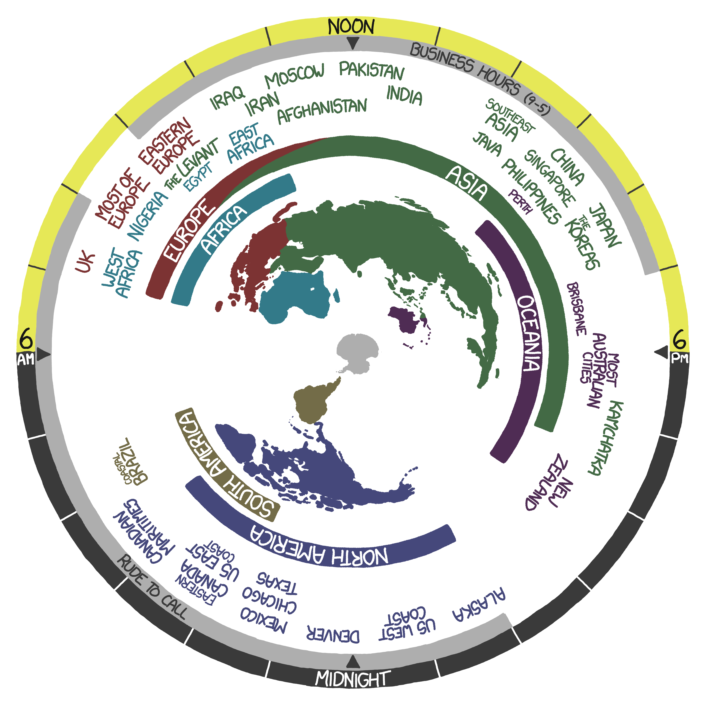 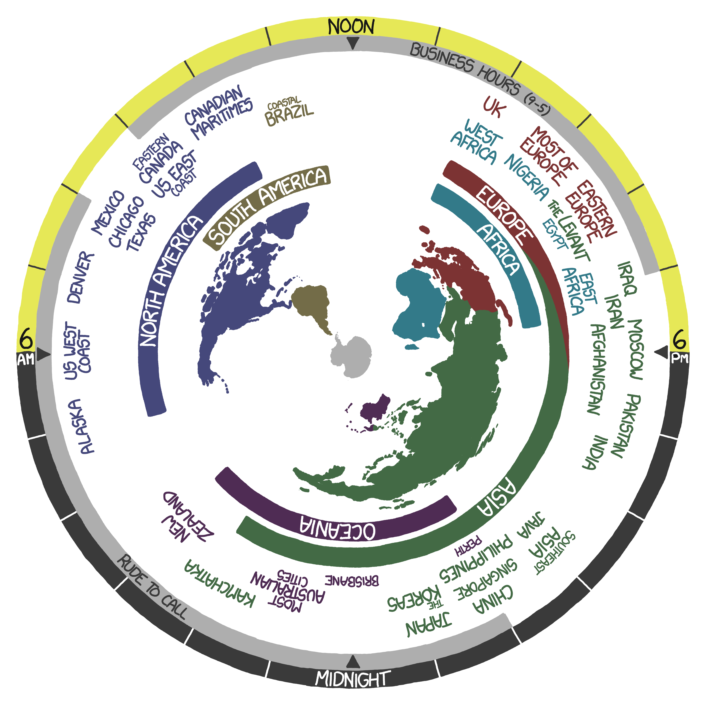 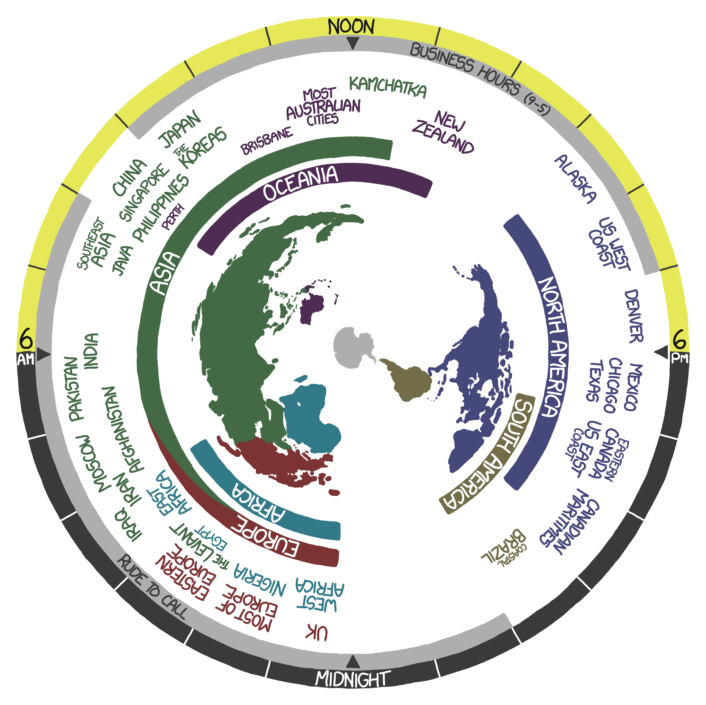 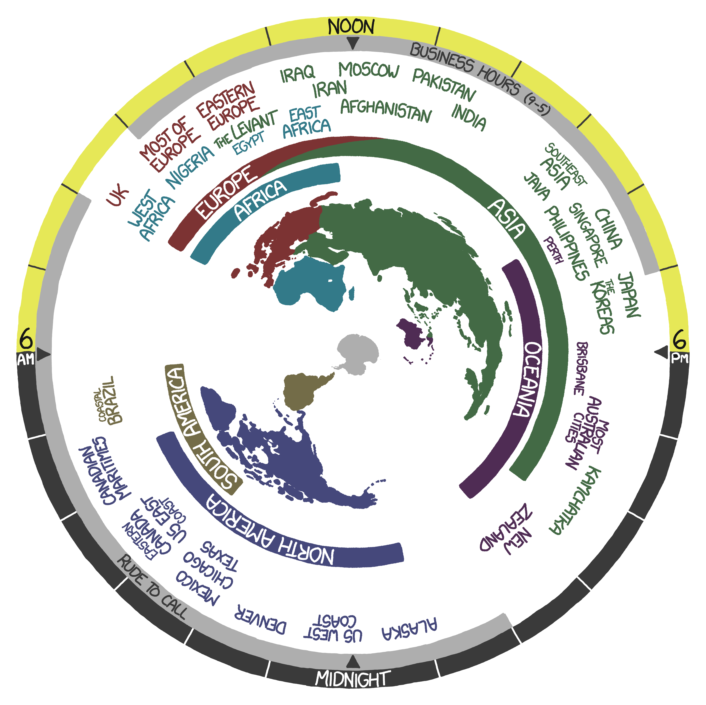 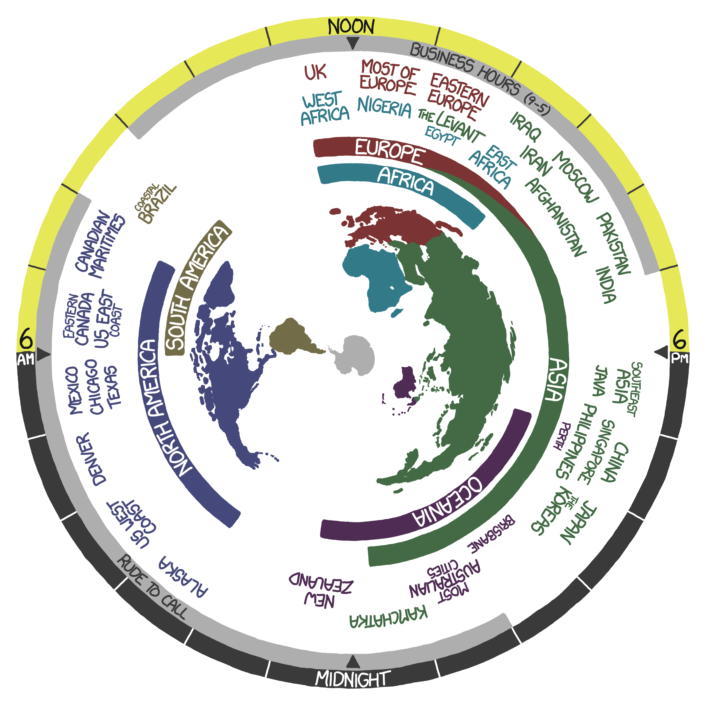 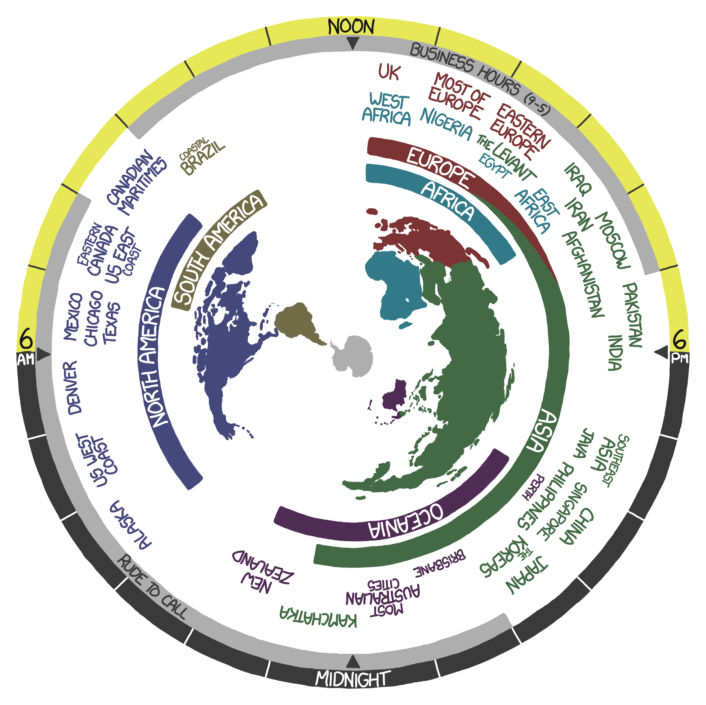 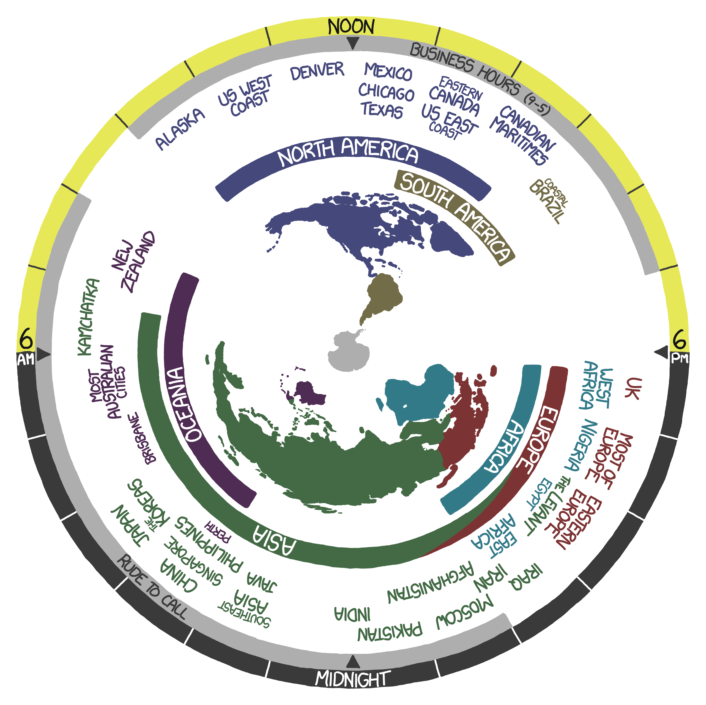 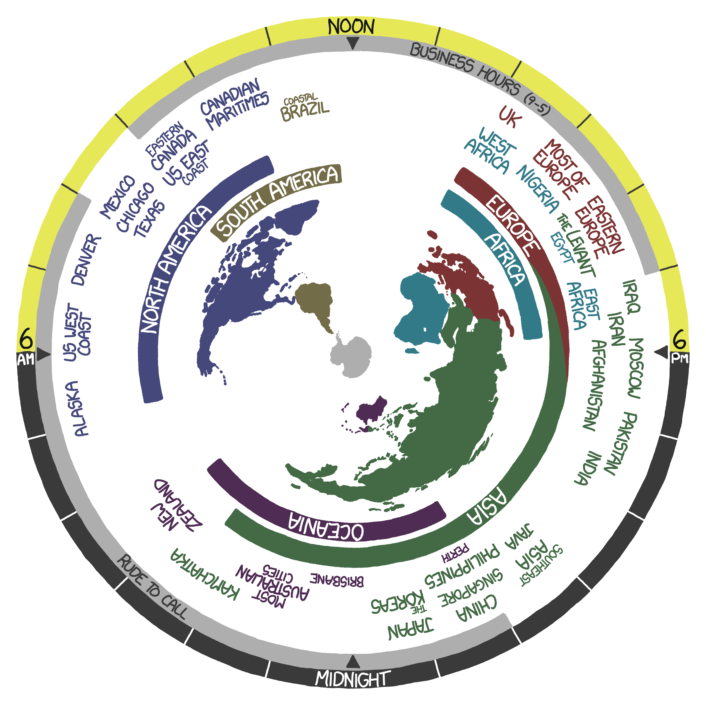 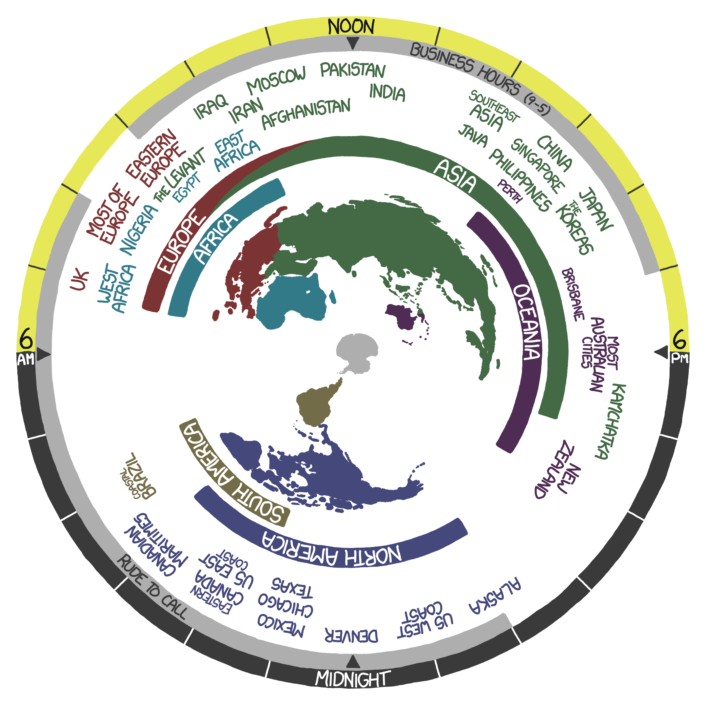 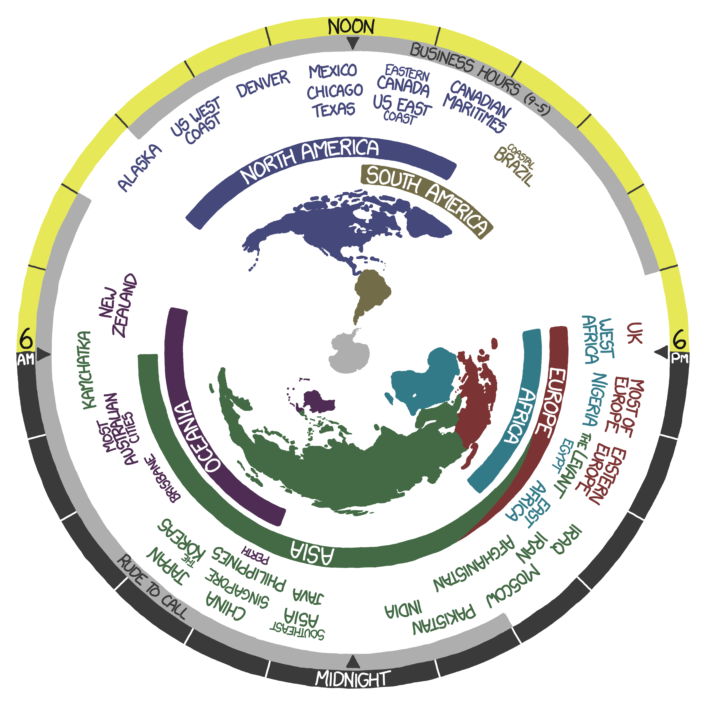 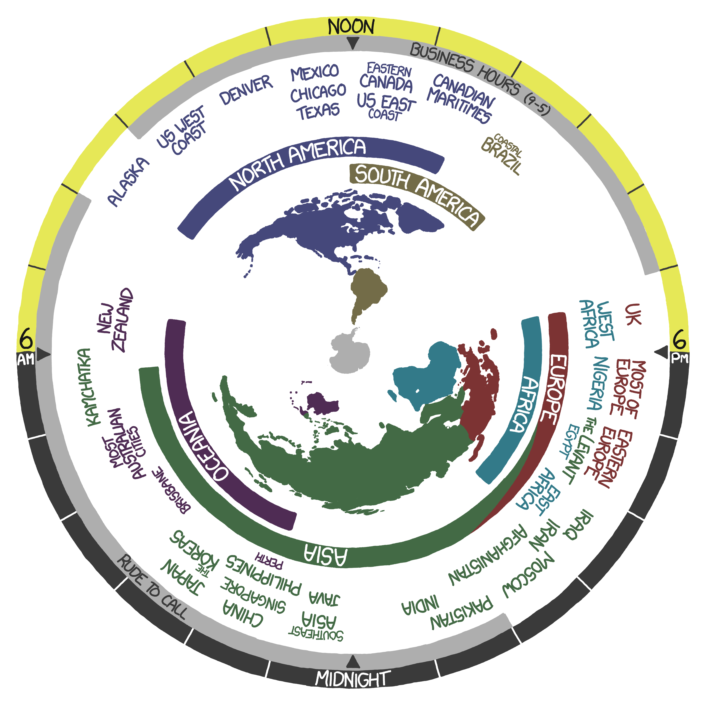 The map shows the configuration of time zones with respect to daylight saving time (also known as summer time) at the time of the comic's initial release (February 2014); it was being observed in parts of Australia, New Zealand, Brazil, and other countries not named in this comic. 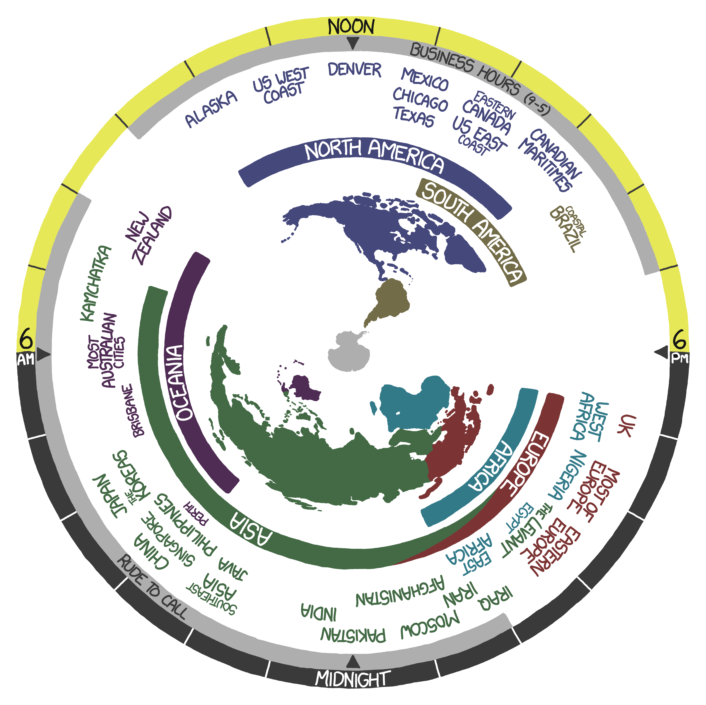 If the map were to stay accurate through the year, the location of place names would have to move over the next few months as parts of the southern hemisphere went off DST and parts of the northern hemisphere went onto it; however, the map failed to change on the morning of March 9 as it should have (to recognize the start of DST in North America). In many countries "business hours" are considered to be from 9 am to 5 pm. With some exceptions, including emergencies, it is generally considered rude to place a telephone call to someone's residence during the hours when most people are asleep; Randall portrays this time period as extending from 10 pm to 8 am. This may be a reference to the 10 pm "cutoff" time discussed in an episode of "Curb Your Enthusiasm." Iraq, Kuwait, Saudi Arabia, and more. Pakistan, Western Australia, Maldives and some France former colonies. China uses only one time zone while the country spans about five. 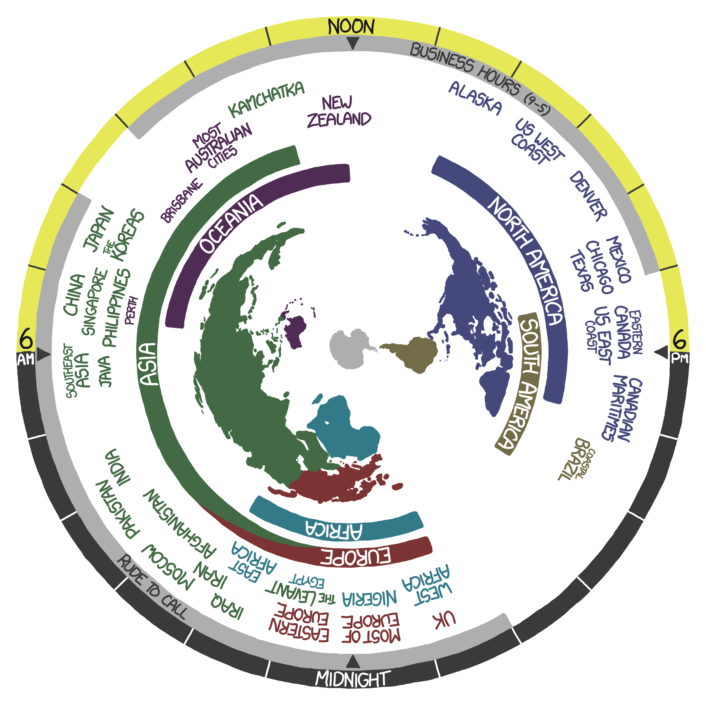 US East Coast including New York and Florida. Most of the Caribbean Islands. 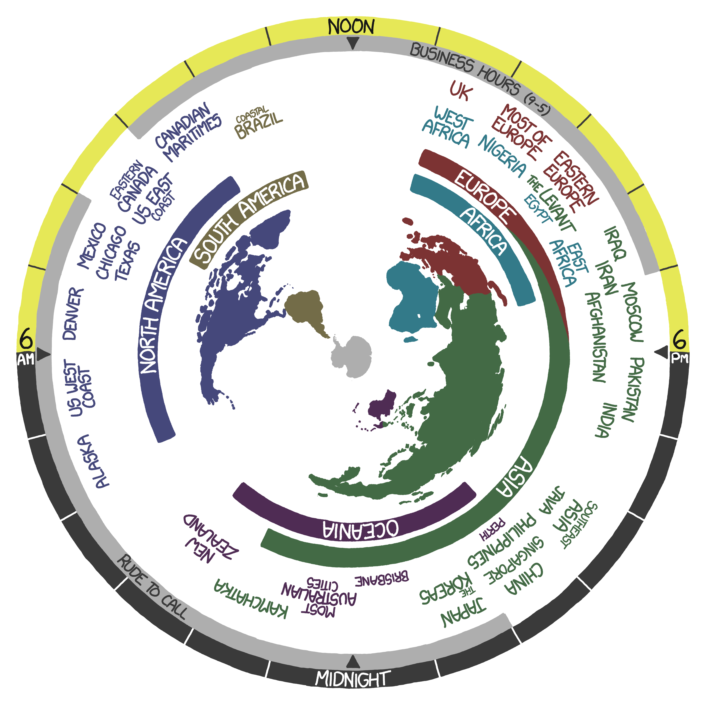 When first posted, the picture was exactly 12 hours off. 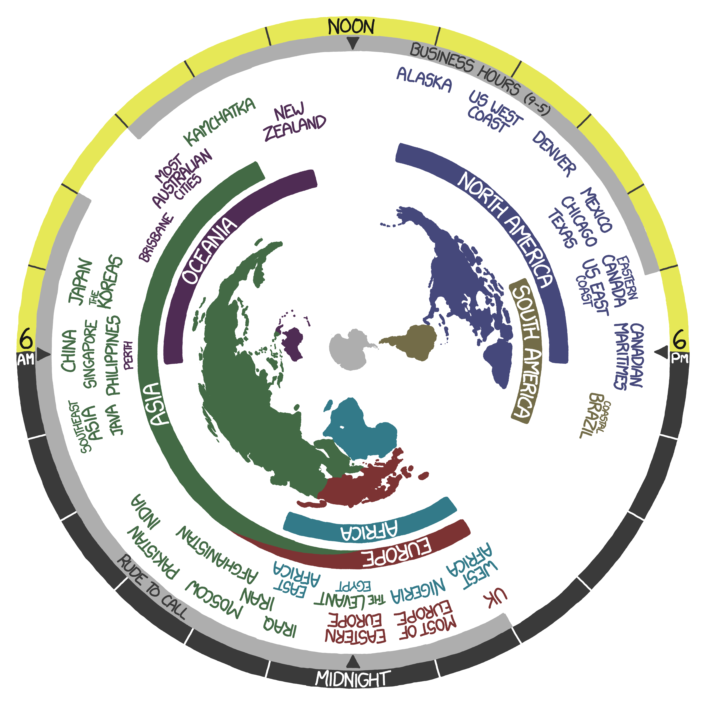 Somewhere around 5:10 UTC, this was fixed. The original version also included a listing for Inland Brazil; this could have created a conflict with US East Coast when Daylight-Saving Time begins in the US, and it has been removed. The names used for the image files refer not to UTC (Universal Time) as one might expect but rather to the time exactly 12 hours off of that. The name of the image file linked from the page matched Universal Time during the first few hours, but the file-naming scheme did not change when the comic was corrected. A script that automatically updates the wallpaper for the current time. A bash script that automatically updates the wallpaper for the current time, written for a Debian system running i3. May work well for other linux distributions as well. An Android widget version of the comic. An offline version of the comic made using C++ and SFML. FIBA and, before 2006, FIFA. (In 2006 FIFA moved Australia from Oceania to Asia). As a further parallel neither the sporting bodies nor the comic actually mention Antarctica. Note that the comic does not say these are continents. 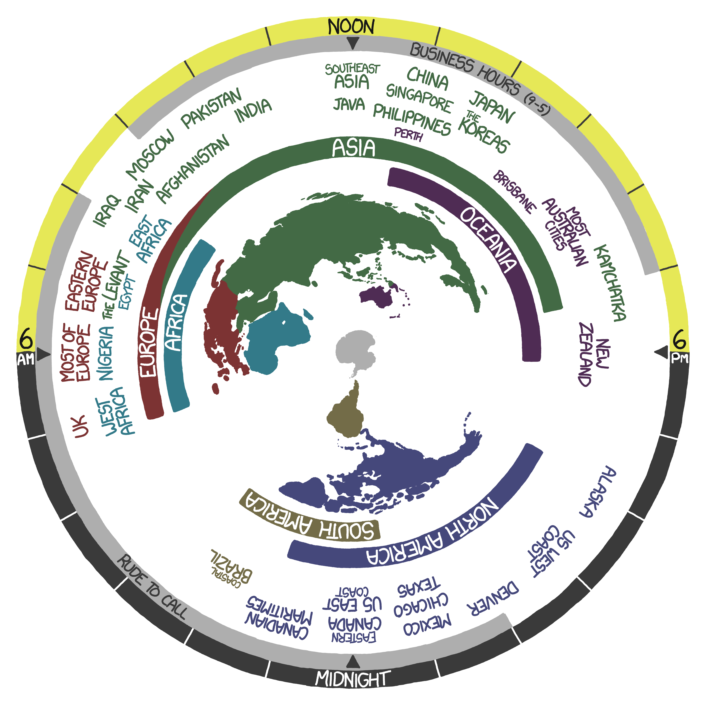 Oceania has some distinct characteristics, so it often shows up as a "region of the world". I'm guessing an indexed APNG could be smaller (due to more efficient compression) than a GIF, but unfortunately I don't thing apngasm is as efficient as GIMP's optimize for gif feature. Who the hell does register an entire domain  for only this comic? 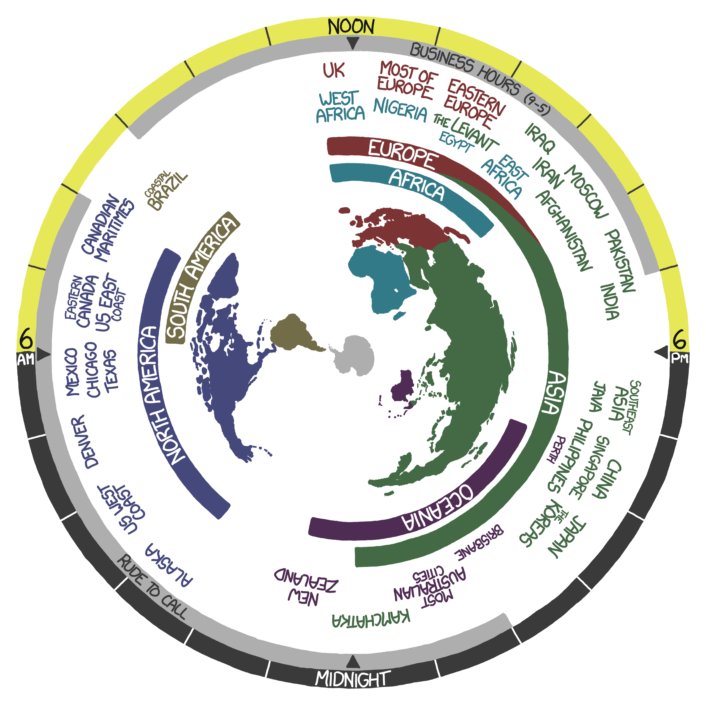 This page was last edited on 4 June 2018, at 14:37.